1. Remove firing pin retaining pin (1). 2. Tip key and bolt carrier assembly (2) allowing firing pin (3) to drop out. Catch the firing pin. 3. Rotate bolt cam pin (4) 1/4 turn and lift straight up to remove. 4. 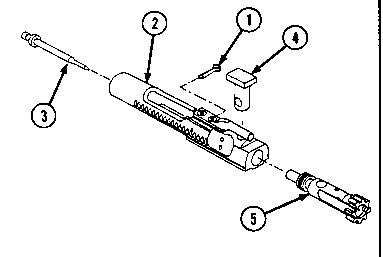 Remove bolt assembly (5) from key and bolt carrier assembly (2). 3-10. BOLT CARRIER ASSEMBLY (CONT). [a) Inspect bolt carrier assembly (1) for burrs, cracks, wear, and evidence of gas loss. [b) Visually inspect the carrier and key screws (2) for looseness and proper staking as shown below.